A game without Easter Eggs is no perfect match: Therefore, ID Sofware has also included a couple of nice Easter Eggs in the DOOM. They range from references to other games start from 1993. 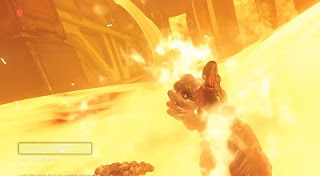 In this guide you'll get a small taste of what there is to see in Doom Easter Eggs. It is certainly no longer a secret, the hidden level that you find in every mission in the single player Campaign. By using a lever you open a secret door behind you will find a part of the old Doom map from Doom 1 and 2. An Easter Egg, which has worked well already in other games, such as in Wolfenstein. In Doom 2016 you can, incidentally, at the end of play of all the old maps. - Fallout: DC - In your first mission, you will find at the beginning of one of the doors that has Vaul-Tec logo from the game Fallout. - Terminator 2 'Day of Accountability': Do you remember? The Terminator sacrifices himself and rises into the lava, at the end one sees only his hand, which he shaped into a thumb up. In the third mission of the Campaign in the lava (ideally after a save point). - Commander Keen: You can find Commander Keen, the little adventurous boy from a game of the 90, in the 6th mission "Kadingir Sanctum". You find yourself in the area of Easter Eggs, when you come to a cave above the emblazoned a giant demon head and a fire burning in front of it. You already see this from afar. Now jump on the platform over to the cave. Look around to find the set pecked skull with Commander Keen helmet. - Skyrim 3: An allusion to the Dovahkiin can be found also in the 6th mission and indeed after the fight in the big square with the Hell Baron at the end of this level. After opening the big gate, look in its direction and rotate you 180 degrees and run to a cave there. In here you will find a skeleton that has a helmet with horns on. - Dopefish: The big green fish with the buck teeth, which is also an opponent in Commander Keen, is found in so few games again. In Doom 2016 in the form of Asian food. In all levels you encounter standing around noodle boxes. Look at them closely, because you’ll find the Dopefish printed on them. - Face of Marines from Doom 1: Sure, on the one hand you will find the Classic Doom level, but you are in the navy from the year 2016. But if you will die by the explosion of a barrel, then fall off your head, before you fall down and you see in the helmet head of Doom Marines of Doom 1. Although, if you don’t die by a blast barrel, then fall off your head, but you see only the helmet before you drop without a face in it. - Super Turbo Turkey Puncher 3: This game already existed even in the Doom series. To find you press the button and strike on turkey. Funny goodie snack. You can find this Easter Egg in the form of a small game room behind some boxes in the 8th mission "Expanded research complex". You must in an area where you will meet many Revenants and Mancubus daemons, turn off the security field with a display - this is a normal mission task. But before you move on, go to the airlock and into where you will find a bunch of boxes in the corner. Climb over it and behind it you will find the two arcade machines. - Yet another mini-game: You can find the mini-game "DOOM Demon Destruction" in the 9th mission in the Lazarus-labs in the office of Olivia Pierce. It is on a usable computer in the room where you see the holographic coffin. The game is similar to Candy Crush. But it is interesting that the names are taken from the ID Software developers in the high score list and mark the points data. For example, 5132016 of 05/13/2016 - the release date of Doom 2016. - The Symbol of Sin: If you are in the Mission called Necropolis, then you come across a giant demon skull on a wall. He carries the symbol of sin on his forehead. Bombarded the glowing red icon, it was at a level of Doom 2 the weak point of a boss. Meet him right, then a cube will float there from which contains a collection object.